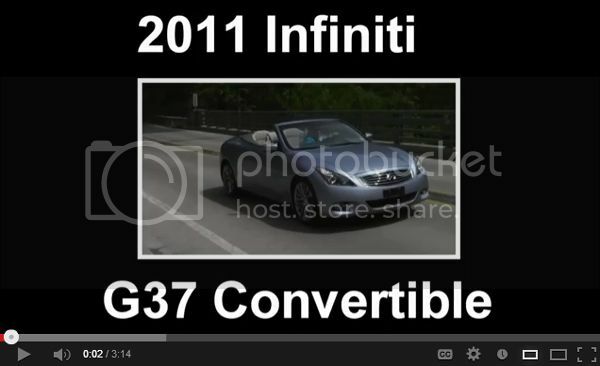 Crank up those speakers & watch Ken Beam show-n-tell all about this absolutely stunning 2011 Infiniti G37 Convertible at Douglas Infiniti in Summit New Jersey. This beautiful Luxury Hard-Top Convertible only has 4,282 LOW miles!!!!! Hardly broken in! Why Lease a G37 Convertible when you can buy this one! Had an awesome time speaking and learning at Brian Pasch`s Automotive Bootcamp this week in Philly! Heck I even ran the steps that Rocky ran on yesterday after we checked out of the hotel! Well that sounds like a plan Tom! If you need any advice or I can be of assistance please feel free to email me directly at kenabeam@aol.com or call me at my office 908-522-7300 x 118 ........I`d be more than happy to help. I own a Chevrolet dealership in a small rural southern MN town. I am trying to use my interest in technology and internet marketing to set myself apart from other area dealers. Thanks for the tips on videos. My pleasure Tom - Yes as I said, you really don`t need elaborate equipment........... but if you want that video to have some sort of "Wow" Factor........then you`d better be creative! Where do you work????? You`re more than welcome to call me anytime at my office at 908-522-7300 x118 if you have any other questions or need some advice. Ken, thanks for taking the time to respond...that was very kind of you. It looks like you go for 'simplicity' in the equipment and 'creativity' in the production....thanks so much for the great info. only has 4,282 LOW miles!!!!! Why Lease a G37 Convertible when you can buy this one! @ Ken - Thank you very much Ken. I appreciate the nice compliment. @ Tom - Sure you can ask me anything, not a problem. I use a couple different cameras(depending how I feel that day!! lol!) but a great camera to use that won`t break the bank is my old trusty JVC Everio. Nowadays there is a wealth of great cameras out on the market and guess what?? They all will work fine. 2. How about mic? External or built-in to camera? As for a mic, the answer would be no. I have never used an external mic in any of my videos. I`m very cognizant when I`m speaking as to the direction I`m facing when speaking. 4. Who does the editing? 5. How do you decide the process in editing? This is where I`m known to be very creative Tom. Believe it or not, generally speaking I get an idea in my head or maybe I`ll wake up in the middle of the night and write it all down or perhaps I`m driving to work and come up with a cool concept and I`ll sit down with Pat my assistant and explain my thoughts as to what I want to create. Then again a lot of times I really like doing much of my work off-the-cuff, as this usually works out extremely well for us. Hey you can have the best cameras, best editing software, microphones the whole nine yards........... Ultimately it comes down this Tom............... How creative can you be AND more importantly............ Are you willing to go out and just do it? Remember................ you`re not making "Gone With Wind"! -lol! Sooooooooooooooooooooooooooooooooo have fun with it and be sincere........... customers will pick up on your sincerity and if you are comfortable in front of a camera........ or not.